Box Text: The best-selling franchise in PS3 history is back. 07-23-2015 dirtymik3 Box Text The best-selling franchise in PS3 history is back. The definitive multiplayer experience returns bigger than ever. Special Ops co-op reinvented with all-new Survival Mode. 11-21-2011 mrnelson Box Text The best-selling franchise in PS3 history is back. The definitive multiplayer experience returns bigger than ever. Special Ops co-op reinvented with all-new Survival Mode. 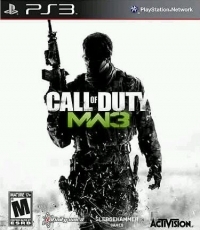 This is a list of VGCollect users who have Call of Duty: Modern Warfare 3 in their Collection. This is a list of VGCollect users who have Call of Duty: Modern Warfare 3 in their Sell List. This is a list of VGCollect users who have Call of Duty: Modern Warfare 3 in their Wish List.